These caps are manufactured locally and exclusively for VMGP. They are produced in heat treated cast iron, fully machined and unlike a similar reproduction product, we incorporate the original factory reference numbers to include correct font "MG348-118". 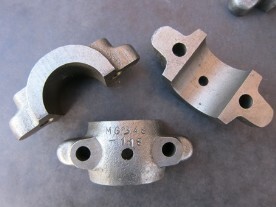 The above photo highlights castings without machining for the dowel pins. This is deliberate as we are aware through our research that the MG factory used more than one jig during production and therefore, we could not guarantee cap interchangeability with original base units if we were to insert the dowels. We are jigged up however, to insert dowel pins but as this cap is precision machined and self-aligning, we see no benefit.